Rejoice! It’s Girl Scout Cookie Season! It’s the most wonderful time of the year, boys and girls. GIRL SCOUT COOKIE SEASON. While wandering around Harvard Square on Friday evening, I spotted a woman carrying two boxes of Girl Scout cookies. My sixth Girl Scout cookie sense immediately went on high alert. I resisted the urge to shake her by the shoulders, wild-eyed and foaming at the mouth, demanding to know where she bought them. I knew that cookies were close. Obviously I was right, my Girl Scout cookie sense never lets me down. Those wonderful gals are selling them at a bunch of subway stops in Boston. 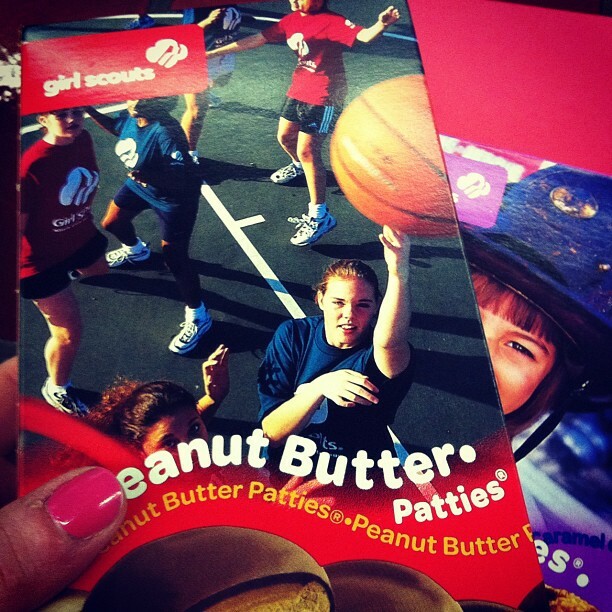 I bought two boxes: Peanut Butter Patties and Caramel DeLites. Those are clearly the two best options and you can just get away from me if you would have chosen the Lemonades. Blech. Just can't get enough of those "eanut" Butter Patties, amirite? If you’re in Eastern MA, you can find cookies near you here. God, the Internet is so great. So what’s your favorite Girl Scout cookie? Do you agree that Thin Mints are overrated? Are you weirded out when you realize that the same cookies have different names depending on where they’re sold? Do you like my pink nailpolish? Happy Girl Scout cookie season!